Joel Velasco/PRISM Photographer Heman Armstrong, a senior majoring in cinema, hopes to make his mark on the world of filmmaking. Before being behind the camera, Heman Armstrong wanted to be in front of it. 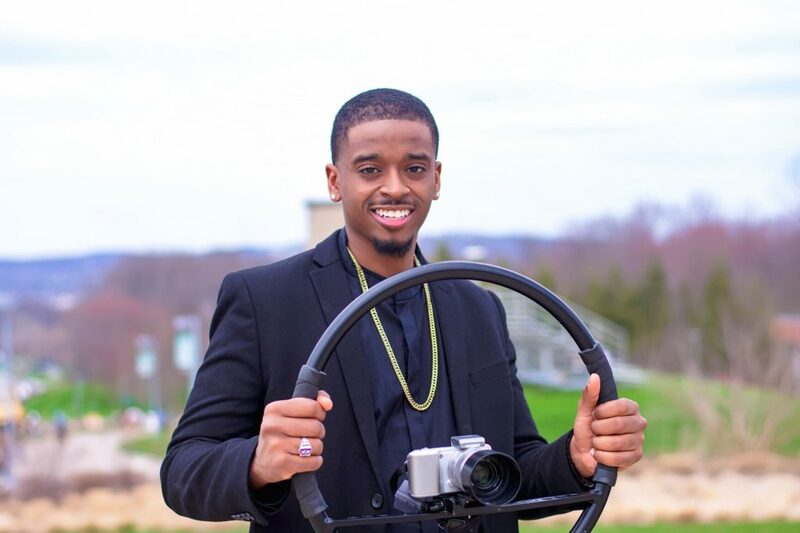 Now a senior majoring in cinema, Armstrong has taken his craft to the next level, filming an array of visuals that showcase a broad range of content. Filming everything from a unity Greek life horror film for the multicultural sorority and fraternity expo, to a campaign video for the new SA President, Jerry Toussaint. Armstrong has created a variety of videos in his short time here. But he didn’t always know cinema was his passion. Growing up, he had always enjoyed working with cameras. When he was in elementary school, Armstrong would make slideshows with photos and videos he took of his family members. He presented them during family events. It wasn’t until late middle school that he finally figured out that cinema was his future. During that time he attended a film camp and made a film with his younger cousins. When he first came to Binghamton University as a transfer student, he declared a cinema major, but received some backlash from his family. They were nervous about him venturing into this industry because of how competitive it was. Even with obstacles he still remains confident in his ability to be a successful filmmaker. “It’s a risk that I am willing to take,” he said. Armstrong enjoys making films that include high-fashion clothing, but he also enjoys editorial films, films that showcase fashion alongside dialogue and a story line. Videos such as “Wolves” by Kanye West, which is also a Balmain Campaign, is among the videos that inspire Armstrong. Armstrong also has a plan to garner an audience similar to that of “Wolves” through using reality television to develop a following. Armstrong said he was casted earlier this year for the MTV show “Are You The One?” but had to decline because he wanted to finish his studies. He is confident, though, that if he can get cast onto another reality TV show he can find an audience to build his brand. Even with a blueprint for how he is going to obtain his success, there are some aspects of his craft that Armstrong thinks he has to work on. Dealing with different personalities sometimes makes him feel overwhelmed.